The Winter Trees design is one yard that can be a wall hanging or quilt panel, or be cut up into separate pieces for quilting and crafting. It can be purchased this Fall in silk, cotton, canvas, or a variety of other fabrics including faux suede. It will be available in my Spoonflower shop. 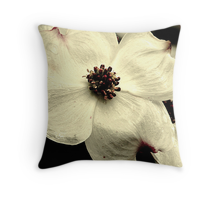 For now, this summer's newest design are these toss pillows from Redbubble with my - sort of vintage looking - floral photographic designs, sizes 16x16, 18x18, and 20x20. 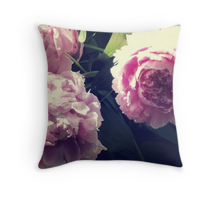 Redbubble lets customers buy the zippered cover, for pillows you already own, or the cover and pillow interior. They are on great fabric, and even if you don't like mine, they have so many incredible artists and designers, you're sure to find something you love.